Everyone knows we do not hesitate to call out cultural appropriation at The Root. So what happens when someone reports a person of color to the fashion police for engaging in that misdemeanor? Will that person use their nonwhite privilege to excuse their behavior? Will they push back against the accusations? Will they shuffle the cultural deck and play the mythical “black card”? Well, this year, apparently a young woman of color didn’t get the notice. Wait a minute. She’s a woman of color, so you can’t call her out. Plus, she’s beautiful, young; she’s at a music festival; and she shouldn’t care about any other culture but her own, right? 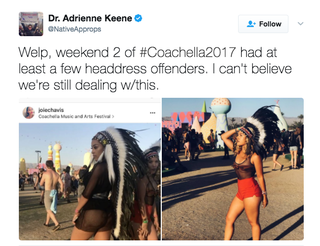 Even though she’s not white, I bet she’s probably going to respond with insensitive indignation, just as some callous Caucasians do whenever they are questioned for using sacred traditions as throwaway props to make them look cool. Guess what unbelievable response this woman gave as soon as she heard that someone thought her attire was offensive to their heritage? She did something absolutely insane. Props to her, and let this woman’s humility, open-mindedness and willingness to accept responsibility for her actions be a lesson to us all. Just because someone makes a mistake and does something racist, homophobic, transphobic or insensitive doesn’t mean that person is a racist, homophobe, et al. This lady did what she was supposed to do. She recognized her wrong, apologized sincerely and learned from it. This is a living, breathing example of cultural awareness, and proof that people can learn from their mistakes.